The Winnipeg Jets closed out 2015-2016 with a 35-39-8 record, good for a last place finish in the Central Division. The club scored 215 goals, the lowest totals in the division, and allowed 239 goals against. Despite the miserable finish, general manager Kevin Cheveldayoff is hopeful about the fortunes of the Jets and the future of the franchise. For one thing, Patrik Laine has arrived. The 18-year-old looks ready to show up on opening day and should be that elite sniper Winnipeg is looking for. The Jets selected him second overall at the 2016 NHL Entry Draft and have been excited about him ever since, especially after he impressed at the 2016 IIHF World Championship in May. 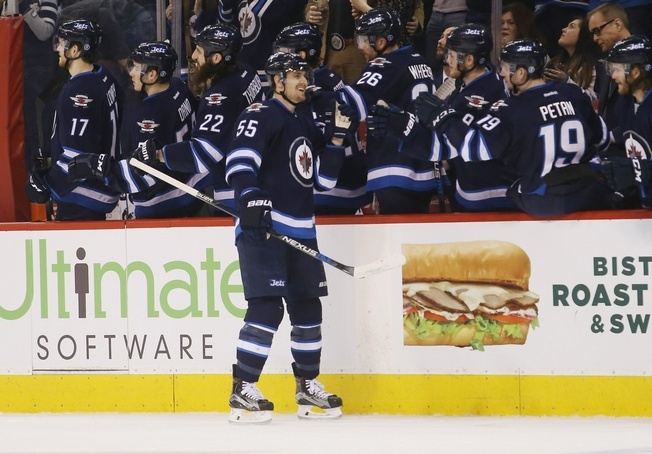 Mark Scheifele is also solidified as a big piece to this team’s future. The centre inked a contract for eight years and has grown into a full-on player with Cheveldayoff’s organization. He’s coming off a career season in goals and should be set to anchor the top line. And he could captain the club someday, too. 23-year-old Scheifele had 61 points in 71 games last season, with seven of his 29 goals coming on the power play. He averaged 18:32 of ice time a game, with 194 shots on goal. Scheifele even bulked up to 207 pounds, which should make him a stronger and more consistent physical presence on the top line. Blake Wheeler registered 78 points in 82 games last season. He clocked in an average of 19:47 of ice time a game and played in all situations. He piled up 256 shots on goal and even scored two short-handed goals. The 30-year-old boasts great size and reach, plus he can blow through high-traffic areas and is capable of controlling the puck in the corners. Centre Bryan Little will probably find himself on the second line thanks to the emergence of Scheifele, but that should suit the 28-year-old just fine. He put up 42 points in 56 games last season and averaged 19:35 of ice time per contest, with two of his 17 goals coming on the power play. He has a terrific wrist shot, but he only accounted for 127 shots on target last season. Laine can play either wing position and has a crackerjack shot to match his immense frame. The Finnish forward lacks high-end quickness and he doesn’t have that physical edge, but the Jets are hoping he’ll fit well on the top line with Scheifele. 30-year-old Drew Stafford had 38 points last season, including 21 goals. He has a deceptively quick shot and likes to play in traffic, plus he uses his size to create space. Dustin Byfuglien is one of the most intimidating players in the entire league. His versatility makes him more dangerous, as he can sometimes slot in as a forward. He had 53 points in 81 games last season and averaged 25:12 of ice time a game. He registered 247 shots on goal and had three goals on the power play. The 31-year-old is an impact player and he’ll continue to anchor Winnipeg’s defence. Tyler Myers had 27 points in 73 games last season and averaged 22:37 of ice time a game. He’s a lanky player at 6’8 and he’s versatile, with the Jets putting him in all game situations. They’d like to see him play with a harder physical edge. He can be beat by speedy forwards and that can present problems in his own end, but he can skate well. Toby Enstrom put up 16 points last season and boasts puck-moving ability to match an intelligent approach to the game. He averaged 20:51 per game last season and plays a low maintenance style. Winnipeg is still trying to figure out what to do with Jacob Trouba, who requested a trade out of town and is a restricted free agent. Ondrej Pavelec was 13-13-4 last season, with a 2.78 goals against average and a .904 save percentage. He’s not the most consistent goalie in the NHL and rebounds can be a problem, plus injuries are an issue. The Jets aren’t banking on him to do much, but he can form a tandem with Michael Hutchinson in a pinch. Connor Hellebuyck could become the starter if all goes well and Winnipeg is hoping he pans out. The 23-year-old was 13-11-1 last season, with a 2.34 goals against average and a .918 save percentage. He also posted two shutouts. The hope is that Hellebuyck will be able to handle the pressure behind a greater workload. The Jets have been adamant when it comes to building their team from the draft and their development strategy should start paying off big time. Laine and Hellebuyck will play key roles this season and there’s a lot to like in the pipeline, including winger Kyle Connor. Winnipeg picked him 17th overall in the 2015 NHL Entry Draft and they love his goal-scoring upside. Defenceman Josh Morrissey could see an uptick in fortunes depending on how the Trouba situation pans out. The 21-year-old has tremendous skating ability and he can mix it up when things get physical. He’s not the most sizable blueliner in the pool, but his vision for the game makes up for any shortcomings. There are more than a few questions in Winnipeg’s immediate future. Trouba’s status leaves a lot of balls in the air, while the goaltending situation requires consistency. That said, the emergence of Scheifele as a top-drawer forward helps a great deal and Laine’s arrival is worthy of headlines. The Jets may not be a playoff team just yet, but they’ll give the division a run this season.